How communities are designed and function can promote—or inhibit—physical activity for children and adults. The built environment consists of all man-made structures, including transportation infrastructure, schools, office buildings, housing, and parks. Children’s ability to be physically active in their community depends on whether the community is safe and walkable, with good sidewalks and reasonable distances between destinations. Research is still emerging on the exact interaction of the built environment and the impact on childhood obesity. Yet, a series of research studies suggests that attributes of our current built environment, such as low density development and sprawl, have had a negative impact on health outcomes, contributing to obesity and related health problems. Several of these studies have found that areas with greater sprawl tend to have higher rates of adult obesity. The combination of greater distances between destinations as development sprawls outward from city centers and the lack of pedestrian and bicycle infrastructure contributes to eliminating walking and biking as options and to increased driving. One-fifth of all automobile trips in urban areas are one mile or less, and over two-fifths of these trips are under three miles, distances easily walked or biked if the proper infrastructure were available Low-income communities in particular often have a higher number of busy through streets, poor cycling and pedestrian infrastructure, and few high-quality parks and playgrounds—all elements which seem to deter physical activity. On the other hand, communities that emphasize pedestrian-friendly design have the potential to bring about better health outcomes. Such designs help decrease automobile travel, increase opportunities for physical activity, enhance public safety, and improve air quality, while simultaneously preserving agricultural and other environmentally fragile areas. Research suggests that doubling residential density across a metropolitan area might lower household vehicle miles traveled by about 5 to 12%, and perhaps by as much as 25%, if coupled with other measures. Creating new walkable, bikable communities can be feasible, but retrofitting the vast majority of existing American communities poses a separate challenge. This includes revitalizing older, traditional neighborhoods, often found in center cities or towns, to make them more viable, active communities. It also includes retrofitting newer sprawling communities to diversify their transportation options, creating a more walkable street grid. 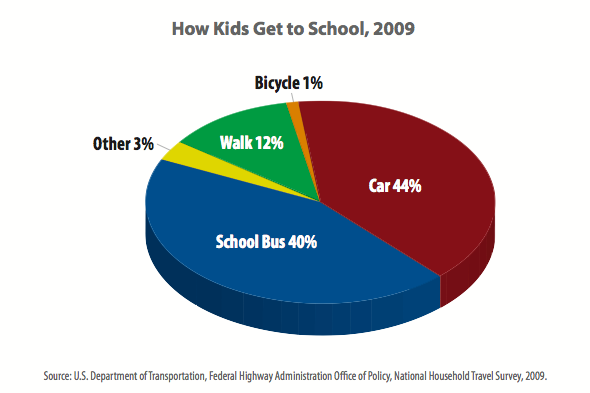 Programs like Safe Routes to Schools (SRTS), funded by the U S Department of Transportation (DOT), have proven an effective way to get students safely walking and biking to school. Serving students in grades K-8, the SRTS program supports capital investments, such as building sidewalks, crosswalks, creating better community designs, and providing other supports for active transport. Nearly 6,500 schools are participating in the federal SRTS program, which has provided $612 million for this purpose since 2005. SRTS helped and continues to help increase the number of students walking to school and decrease those being driven to school. A study of SRTS sites in California showed a 38% increase in students walking to school. Recommendation 5.8: Reauthorize a Surface Transportation Act that enhances livability and physical activity. A complete network of safe bicycle and pedestrian facilities would allow children to take more trips through active transportation and get more physical activity New Federal aid construction projects should accommodate bicyclists and pedestrians by incorporating“Complete Streets”principles As improvement projects for existing facilities are undertaken, transportation infrastructure should be retrofitted, where feasible, to support and encourage bicycle and pedestrian use State and local money can also be leveraged to support safe facilities for children to walk or bike to places like parks, playgrounds, transit, and community centers The reauthorization could adopt Complete Streets principles that would include routine accommodation of walkers and bicyclists for new construction, to influence retrofitting of existing communities, and to support public transportation. In addition, it could enhance authority for recreational areas on public lands.